15.537 Rosen haben dieses Jahr (2015) den Forest Lawn geschmückt. 15.627 Rosen haben dieses Jahr (2014) den Forest Lawn geschmückt. 13.477 Rosen haben dieses Jahr (2013) den Forest Lawn geschmückt. 10.477 Rosen haben dieses Jahr (2012) den Forest Lawn geschmückt. 4.500 Rosen haben dieses Jahr (2011) den Forest Lawn geschmückt. 3.500 Rosen haben dieses Jahr (2010) den Forest Lawn geschmückt. Die Aktion die von der Gruppe "OneRose4MJJ" gemacht wurde ist mal wieder ein voller erfolg gewesen. wenn ihr gespendet habt für die kinderimpfungen an michaels geburtstag bei "ONEROSEFORMJ" bitte lest euch diesen brief durch - SOFIE IST VERSCHWUNDEN, UND UNICEF HAT DAS GELD NICHT BEKOMMEN. WIR REDEN VON UNGEFÄHR 10.760,00 $! Informationen findet Ihr unter folgendem Link - auf dieser Seite werden für die nicht-registrierten User unseres Forum alle Informationen erhalten die bisher zusammen getragen wurden und die noch folgen werden. !!! DIE SEITE WURDE GESCHLOSSEN WEGEN ZUVIELEN BELEIDIGUNGEN UND BESCHIMPFUNGEN VON FANS !!! I've already set one up to have ready for future projects. 4500 Rosen kamen zusammen, ein toller erfolg. Nun wollen die Fans und die Organisatoren zu Michaels Geburtstag eine Weitere Aktion starten. Es geht um das Impfen von Kindern. Geld wird gesammelt um es anschliessend der Unicef zu geben um den Kindern dieser Welt es zu ermöglichen, das sie eine Impfung bekommen. Eine Impfung kostet 2 $. In der Nachricht, die per Rundmail an die Mitglieder der Gruppe und an die beteiligten Fans geschickt wurde, könnt Ihr die Informationen die Ihr benötigt lesen. Bis jetzt sind 659 Impfungen zusammen gekommen. 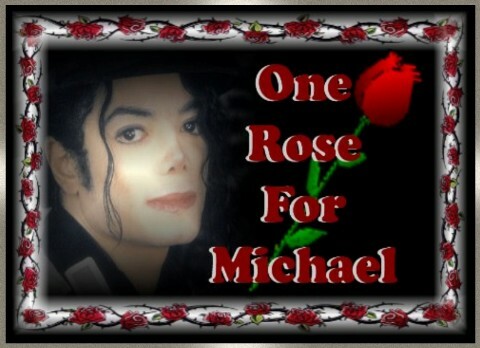 I want to thank everyone who helped when we gathered roses to Michael for June 25th. Everyone who helped those who needed help, all who spread the word on Facebook, Twitter and other platforms around, everyone who invited their friends, and especially everyone who sent roses. Together, we received 4500 incredible roses, placed solemnl...y outside Holly Terrace on June 24. Have not you seen the pictures yet, take a peek in the album of the group. You will not be disappointed, I promise! They are fabulous. I know that many are tagged to start the project for Michael's birthday, and that is why I write this now. In less than two months Michael turns 53, and to honor him this year, we have together decided to help the children. Together we will ensure that as many children as possible in the countries that need our help, will be vaccinated against tetanus, measles and polio. These are vaccines that are vital in these parts of the world, and it is heartbreaking that there's not enough money to give all children a life free from these terrible, often fatal, diseases. If we can help we will do it, and we will do it now. For 2 USD, you can vaccinate a child against all three diseases. I never thought about how little it cost to help. It takes really not much at all. There's probably not a single day of the week when I don't spend 2 dollars on something unnecessary. When I think of how many children my wasted money could save, I want to give everything I have. $10, that's what a meal at McDonalds costs. It is less than a movie ticket costs. And it can save the lives of five innocent children. No, now it's time we do something. Now it's time that we take up where Michael left and continue to fight for every kid. I hope that as many as possible will join in and help. The Paypal account is open for donations from now, and I urge everyone who are able, to help. The donations goes to the same old email address, oneroseformichael@yahoo.se and all who want their name on the list MUST mention this in the paypal message, otherwise, they end up as anonymous. August 29, I will send our (hopefully BIG) donation to UNICEF in Michael's name, and then I will send the order confirmation along with our names to Katherine. It is absolutely fine to send a message to Katherine like last year, either addressed to Katherine, Michael, or just something you want to say. I will print them and send them together with the other. I will only include messages from those who actually helped and donated. I hope no one thinks it is mean, I just want it to be fair. If you want to send a message, send it either in the PayPal message box or send it to me in an email or PM on Facebook. Always include your paypal email address if you send the message outside of paypal, otherwise I can not connect it to your donation. Now, we will send vaccine!! So wie letztes Jahr wird auch dieses Jahr wieder die Aktion gemacht. Das in der Email angegebene .se steht für Schweden. Bis zum 14. Juni 2011 läuft die Aktion. Together, the members of One Rose For Michael Jackson have made alot of wonderful things happen in the short year we've been together. For Michael's 1'st anniversary of passing, June 25 2010, we provided the entrance to Holly Terrace with 3000 red Freedom Roses from members of the group. They were the most amazing roses we had ever seen, and alot of pictures were taken and placed in our photo album in the group. For Michael's birthday, August 29 2010, we together collected enough money to plant 1000 new trees in honor of Michael. The certificate we sent to Michael's mother, Katherine, and with remaining funds we supported the AIDS walk in Los Angeles. For Christmas 2010 we collected enough money to provide 6 families in need with food, presents and toys all in Michael's name. Now we're almost 2 years from Michael's passing, and for the second anniversary of his passing we once again want to fill Holly Terrace with our roses. The donations are open, and anyone who wants are welcome to sent their roses to Michael. The roses costs 3 USD each, and you can send as many as you want. OBS!! If you want your name to be placed in the donors list available in the discussion board of the group, you HAVE to tell me this when you send your donation, either in the message box in paypal, or in a PM to me here. If you don't, I will not put your name in the list. If you can't use paypal, you can send your donation via a bank transfer, or via Western Union. Please send me a PM for details if you need to use any of these options. Now lets make HT as pretty and filled with L.O.V.E. as last year! Lets show everyone that we are still here, and our love and support for Michael is stronger than ever.